Sweet Corn Festival Amusement rides in the midway provides hours of fun for the festival attendees!! 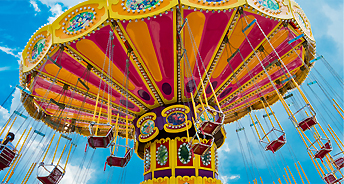 Durant Enterprises offers over 20 amusement rides for the festival midway. The following information details the pricing for this years Festival. Single tickets $1.50 or 30 tickets for $35.00. All rides take 2 to 3 tickets. Wristband for Ride Special is $20.00. Purchase a wristband for $20.00 and enjoy all the rides during the 6 hours noted above. Each day REQUIRES a new wristband. Purchase early – wristbands will not be sold in the final 90 minutes each day of the ride special.